Reviewer obtained a copy from the publisher. I am always on the lookout for books that have anything to do with the military, because what books I do have are always checked out. I have notice that children are less discerning when it comes to reading level. They seem drawn to any book, as long as it has lots of color photos. Recently, I scoured publisher catalogs looking for titles to fit my need when I saw Special Forces, part of the Heroic Jobs series published by Capstone. The large font makes for easy reading for the series intended audience, grades 1-2. The writing is simple sentences which never go into any detail. "A helicopter flies through the air. A pilot, copilot, and two special force operatives are inside. The helicopter door slides open and the operatives slide down a cable and land safely on the ground. 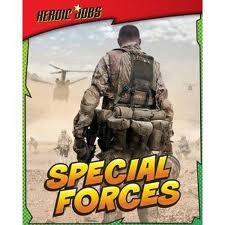 The special force operation begins!" The pictures are well captioned. Most photos reflect what is being discussed within the text on that page, though the entry about spying does not. We read, “The spies dress, act, and speak as much like the local people as possible”, yet the picture shows a solider hidden in the tall grass or repelling off a very tall building. This book is a high interest title. It will fill a need in that subject area. A glossary, books and websites for more information, and index are included.Other titles in the series include: Disaster Relief, Fighting Crime, Fighting Fires, Mountain Rescue, and Rescue at Sea. The only downside for this 32-page tome is the cost: $21.99. Still, it does come with an excellent binding, making it last through the multiple checkouts.